If my 8-year-old had to derive her sense of self strictly from the public recognition she received last week, she’d be insufferable. Good thing she’s got me to keep things in perspective. First, she was asked to sign the Principal’s Book for exemplary behavior at school, which sounds like a nice enough honor. Even I was excited when she first told me the news. But then she showed me the bookmark outlining her good deed: “Carly was quiet in class,” it read. “That’s it?” I said. “Was that so unusual?” She shrugged. “Everyone was talking a lot and my row was quiet.” So she wasn’t even the only one. I could see how it transpired: with school winding down, the teachers were trying to give a last-minute lift to as many kids as possible. The best they could come up with for my daughter was that she contained her ceaseless chatter for one day. Bravo! Las t year she got to sign the book for helping a classmate do his math; at least then she was recognized for doing something instead of for not doing something (ie talking). I have trouble believing she’s genuinely proud of that, though she did promptly hang the notice on the refrigerator. I hope no one who comes over thinks I put it there. She definitely saw the emptiness in the second show of disproportionate appreciation she received. Her 3rd grade in-town soccer team happened to play a team from another town on Saturday, the day of that league’s final awards ceremony. Because my daughter’s team was in the right place at the right time, and because everyone’s a winner, she and her teammates–who, by the way, lost 4-1–each came home with a plastic trophy bearing the other town’s name. 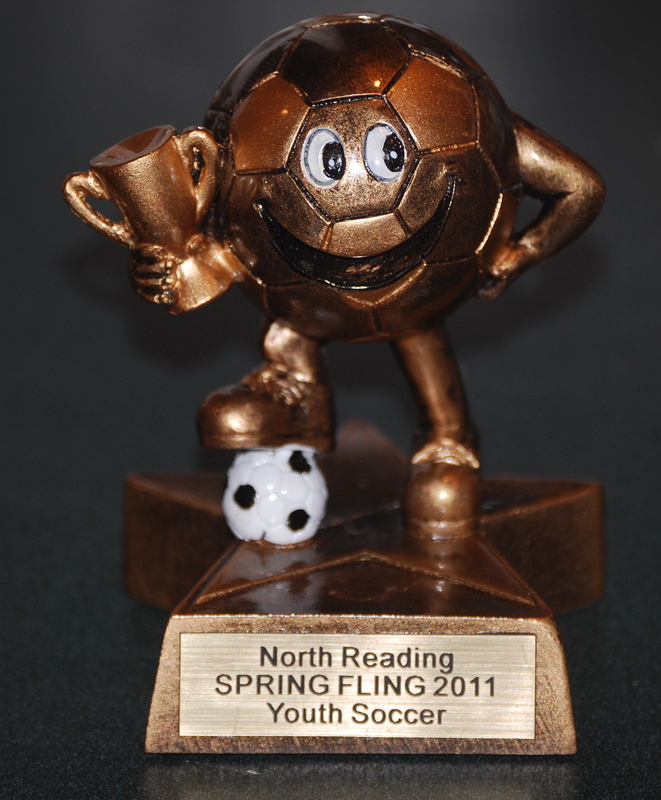 The trophy looks like a smiling gold M&M holding a beer stein, and my daughter didn’t actually want it. But it seemed rude to turn it down when they handed it to her, along with a Gatorade juice box and a Rice Krispie treat, so she accepted it. Maybe they had extra trophies, or maybe they just didn’t want our team to feel left out. Either way, it’s resting briefly on the kitchen counter before it makes its way into the trash. This entry was posted in Cranky mommy blogger, Family life, Kids, Parenting, Reality check and tagged overpraising, soccer trophies. Bookmark the permalink. This reminds me of my son Paul’s ‘reaction when he came home from elementary school one day. He must have been about nine, and on his chest was a sticker that read “I Was Caught Doing Something Right!” This was the school’s way of institutionalizing “ignore the bad, praise the good” in kids. What did you do right, I asked Paul. “Oh, I don’t know,” he said. The new principal nixed the program. Do not trash. We have an ideal space on the piano next to your wedding photo. It will make us proud.